It is such a rare event in the UK, so when the sun comes out to play it seems a shame to head indoors and not make the most of it. There can be fewer simple pleasures more enjoyable than dining al fresco with friends and family, enjoying fantastic views, fresh air and, of course, the company of additional guests from the word of nature. 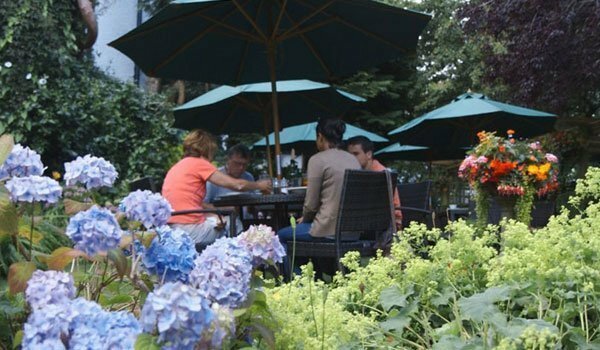 Many of the Great Inns offer outside dining, allowing you to enjoy the true taste of summer – for however long it may last. Serving only local ingredients, organically-reared beef and lamb, and carefully-sourced meats, The Peacock at Rowsley prides itself on its use of quality, seasonal ingredients, and the restaurant boasts an impressive 3 AA rosettes. Sample some of the superb dishes whilst enjoying the peaceful outdoor terrace, overlooking the gorgeous gardens, surrounded by the Peak District’s stunning countryside and with the former manor house as a beautiful backdrop. 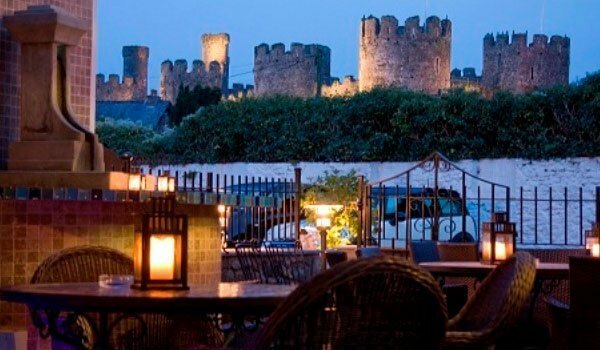 As the site of a 12th century Cistercian abbey, Conwy’s Castle Hotel exudes historic charm, from the traditional, exposed beams to the garden courtyard. Enjoy a feast of locally-sourced Welsh produce in a tranquil, lantern-lit space with a view of Conwy castle in all its magnificence. Situated in the heart of Shibden Valley, Shibden Mill Inn is framed by acres of glorious Yorkshire scenery. Nestled in this landscape, and encircled by charming flora, their newly-renovated outdoor seating area is a bright, serene spot perfect for al fresco dining. 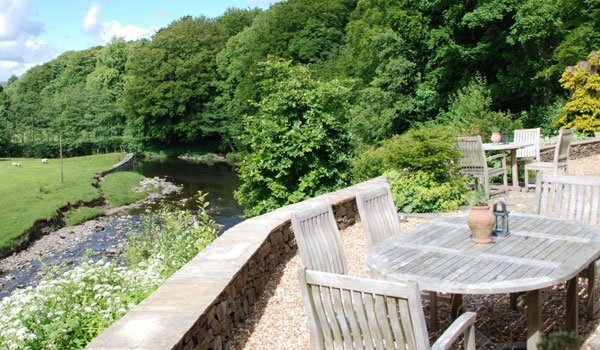 Standing on the banks of the River Hodder, The Inn at Whitewell has spectacular scenery right on its doorstep. From the terrace, views of the sparkling river and vast, rolling landscapes are the perfect accompaniment to the wholesome, delicious foods bursting with local and seasonal produce. Situated in the beautiful Brecon Beacons National Park and a stone’s throw away from the Black Mountains, The Bear Hotel is encircled by stunning scenery. The vibrant, blooming inner Courtyard provides the perfect, picturesque place to dine al fresco on the locally sourced, award-winning food. In the heart of the Cotswolds, The King’s Head Inn is delightfully located overlooking the village green, complete with an array of flowers and a collection of bantams and ducks on the babbling brook. 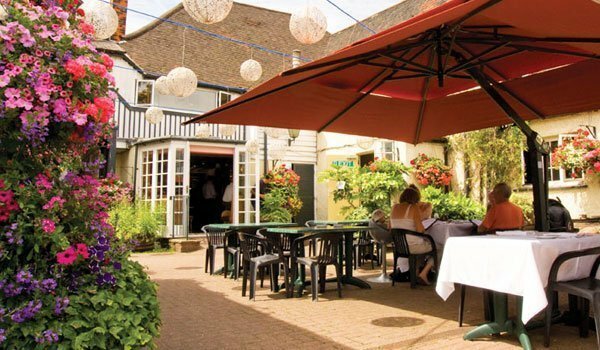 The King’s Head boasts a lovely patio area with is an idyllic spot to enjoy the wholesome, traditional English food. Y Talbot is a charming, 17th century inn, rich with historic character, and is nestled in the foothills of the Cambrian Mountains. Surrounded by beautiful, natural scenery, their brand new outdoor terrace is a blissful spot to enjoy excellent quality cuisine. The exquisite gardens of Hereford’s Castle House Hotel are the perfect place for guests to sample a scrumptious afternoon tea, whilst the terrace of this beautifully-restored, Grade II listed, Georgian townhouse overlooks the castle moat and is adorned with beautiful flowers, providing a tranquil space to enjoy the 2 AA Rosette menus. From your seat on the ivy-clad veranda of the 18th century Castle Hotel, you’ll be treated to unrivalled views of Shropshire’s glorious countryside. 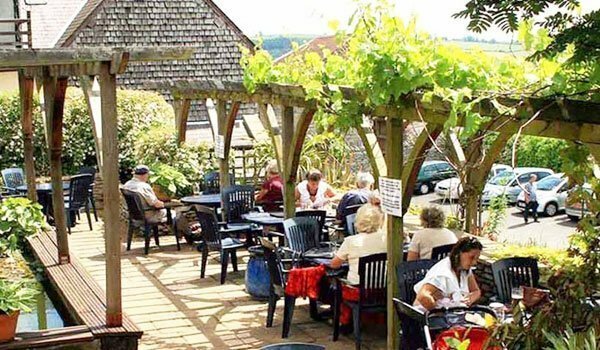 The vibrant terraced gardens and inviting, wooden decks are teeming with beautiful flowers and shrubs, creating a gorgeous space to in which to savour the hearty, flavoursome British food. 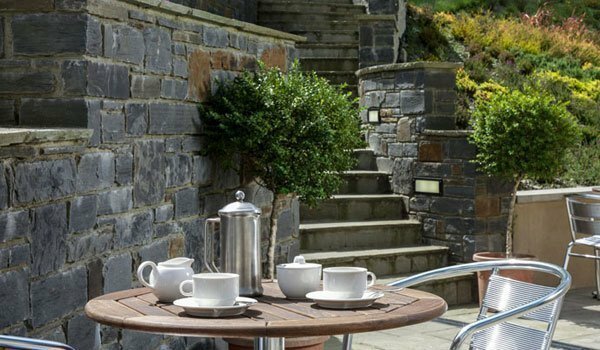 In the heart of Pembrokeshire you can dine al fresco in Wolfscastle Country Hotel’s magnificent gardens. Encompassed by Pembrokeshire National Parks’ incredible, vast, rolling hills and exquisite greenery, the inn’s innovative seasonal menus are based on locally sourced ingredients.